Blue Sky Rhino by Susan Plenzick - 8.000" x 6.375"
Blue Sky Rhino framed print by Susan Plenzick. Bring your print to life with hundreds of different frame and mat combinations. Our framed prints are assembled, packaged, and shipped by our expert framing staff and delivered "ready to hang" with pre-attached hanging wire, mounting hooks, and nails. Joe, Thanks for the v/f and comment. So sad that these guys seem to be going extinct. Thanks for your kind comment, Wayne. Great depiction of 'Curious', Susan, and thanks for your comment on my image. V.
making sure you get his good side!! love his smile, too! :D FAVE! Thanks Shirley. 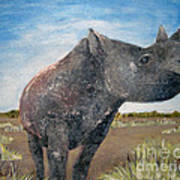 Rhinos are interesting creatures! 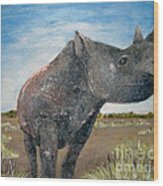 This curious rhino appears to be eavesdropping! 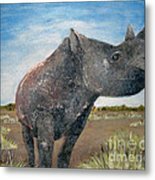 I used metallics, textures, and rock chips to get the sunglow of the sky, the feel of the rock, and the reflection off the grasses, trees and rhino. The sky comes alive at sunrise and softens at dusk.